Alfie Kohn challenged these widely accepted premises, and with them the very idea of classroom “management,” when the original edition of Beyond Discipline was published in 1996. Since then, his path-breaking book has invited hundreds of thousands of educators to question the assumption that problems in the classroom are always the fault of students who don’t do what they’re told; instead, it may be necessary to reconsider what it is that they’ve been told to do – or to learn. Kohn shows how a fundamentally cynical view of children underlies the belief that we must tell them exactly how we expect them to behave and then offer “positive reinforcement” when they obey. Just as memorizing someone else’s right answers fails to promote students’ intellectual development, so does complying with someone else’s expectations for how to act fail to help students develop socially or morally. 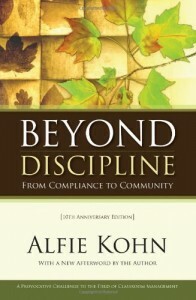 Kohn contrasts the idea of discipline, in which things are done to students to control their behavior, with an approach in which we work with students to create caring communities where decisions are made together. Beyond Discipline has earned the status of an education classic, a vital alternative to all the traditional manuals that consist of techniques for imposing control. For this 10th anniversary edition, Kohn adds a new afterword that expands on the book’s central themes and responds to questions from readers. Packed with stories from real classrooms around the country, seasoned with humor and grounded in a vision as practical as it is optimistic, Beyond Discipline shows how students are most likely to flourish in schools that have moved toward collaborative problem solving – and beyond discipline. Beyond Discipline has been and continues to be one of the most important books to me and to the faculty I work with. The philosophy articulated in the book has transformed the entire culture of our junior high school. After teacher candidates in my class read the first few chapters [of Beyond Discipline], they are always mad: ‘Who does that Kohn guy think he is?’ After the next couple of chapters: ‘Oh, maybe that Kohn guy knows something.’ After they finish the book, they’re on the bandwagon and committed to creating communities in their classrooms.